Mitzi Zilka and Mike Doolin "Lazy Aspirations"
Mitzi Zilka and I have been working together for well over a decade, mostly as a duo but occasionally in larger groups. 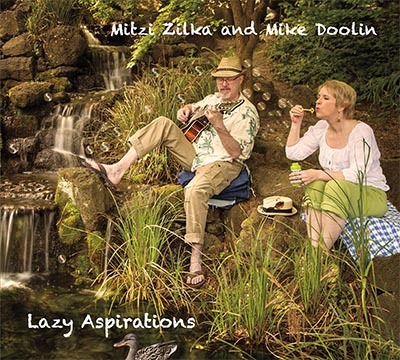 We thought it was about time we documented our duo playing in a CD, and Mitzi had a unique idea for the theme: Lazy Aspirations! Songs about kicking back, relaxing, taking it easy. There are many well-known jazz standards here, some more obscure tunes, and a few slightly more current pop songs which we interpreted through a lazy, jazzy lens. This is a duo record, just one guitar and one voice on most tracks. To vary the soundscape, I used seven different instruments: electric archtops, nylon string acoustic, steel string acoustic, electric semi-hollow body, fretless nylon string acoustic, and fretless acoustic bass guitar. All the guitars are 7-string, while the bass is a 4-string. I did overdub one solo, the fretless guitar on "Lazy Afternoon", and Mitzi overdubbed harmony vocals on "Lazy River" and "It's My Lazy Day". With the exception of those overdubs, this recording is pretty much what a duo gig with Mitzi and me sounds like. Erving Berlin's classic. This lyric sets the tone for the whole album. I'm playing my Eastman electric archtop on this one, it's my main axe. So many of these lyrics talk about the outdoors... I'm playing a wonderful Montalvo nylon 7-string made in Paracho Mexico. We had a little fun with this one, reharmonizing it to create harmonic interest. I'm playing a Raines steel string acoustic and overdubbing a fretless nylon string solo. A mashup of the classic Hoagy Carmichael tune with a somewhat more recent pop hit. This is the Eastman again. Another Carmichael classic. I'm playing my 4-string fretless acoustic bass guitar. The first of two versions of the same song, with different lyrics by the same lyricist. For this Latin version I'm playing the Montalvo nylon string. The great Alan Rankin Jones standard. I'm playing another Eastman electric archtop, the only difference being flatwound strings for a little of that Joe Pass vibe. From the Marlene Dietrich performance in the movie Stage Fright. Hard not to think of Blazing Saddles... I'm playing the Eastman archtop, but not using the pickup; instead I used two microphones to capture its acoustic sound. You know this one, from the Lovin' Spoonful... I'm playing my Doolin thinline electric for a more country-blues sound. The second version of this song, with different lyrics, and we gave it a waltz treatment. Once again, the Eastman archtop. Somehow this tune inspired me to work up a ragtime/Piedmont acoustic treatment, on the Raines steel string acoustic. Not the same Lazy Day as the previous two, this is the Spanky and Our Gang hit from the 60's. We slowed it way down and did a bit of reharmonizing, and discovered a real gem of a tune. I'm playing the Montalvo nylon again. By Smiley Burnette, Gene Autry's sidekick in many movies. This is my Doolin thinline electric again. The Nina Simone classic, with a bit of rearranging. Ending the record as I started it, with the Eastman archtop. My favorite Eastman archtop. This is the guitar I use for most duo gigs. I replaced the pickup with a Lollar Imperial, other than that it's stock. Medium gauge roundwound strings. For the tracks on Lazy Aspirations I plugged it direct into a Pacifica preamp, no amp or mic. The one exception is Laziest Gal in Town, where I did not use the pickup signal and instead miked the guitar acoustically with two studio condenser mics. This Montalvo nylon-string has a pickup in it, but it's actually a little too responsive acoustically to amplify well. I miked it acoustically with two studio condenser mics. Raines Master Acoustic, one of the few 7-string flattops being made today. Again I miked it acoustically with two studio condenser mics. I built this electric 7-string for myself, and to date it's the last guitar I built. It's my main guitar for R&B and rock playing. I played it through a Fender Vibroluxe amp and miked the amp, for a more traditional electric country/blues sound. I built this fretless headless acoustic bass guitar. It's strung with flatwound strings so it sounds remarkably like an upright bass. I miked it acoustically with two studio condenser mics. My second favorite Eastman archtop. I string it with flatwound strings for a more traditional jazz sound. I cut two frets off the end of the fretboard and replaced the pickup with a Lollar Imperial. Again I plugged it direct into a Pacifica preamp, no amp or mic. I removed the frets from this student-grade Hofner classical to make a fretless guitar. I put gray plastic in the fret slots so at a glance it appears normal, and the fret lines really help with playing it in tune. It has a pickup in it, which I plugged direct into a Pacifica preamp, no amp or mic.